The downtown of Medellin, Colombia might not be the most attractive city center in South America. However, like anywhere in the world a place really is about how you chose to view it though your own eyes. I’m sure that as a photographer there are places in the world that I find interesting that no one else does. The Centro Commercial Palacio Nacional in Medellin I think is one of those places. To the naked eye this place is a simple shopping mall. To me it is a playground for my camera lens. The five level building stretches up via creatively placed escalators, the walls are designed in old architecture, and the windows reflect an interesting array of lights. 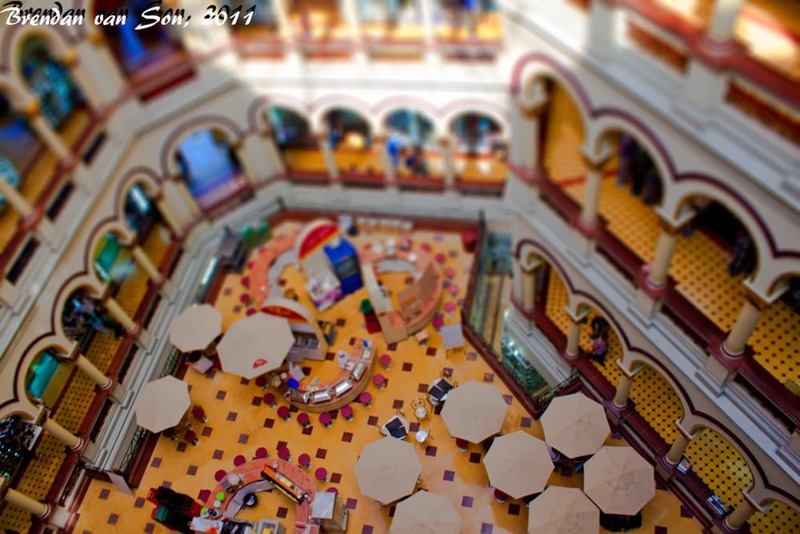 I spent about nearly an hour in this tiny mall playing with a bunch of different shots including the one I took above. This photo is manipulated in a tilt-shift manner via photo shop to give it a look like the scene is miniature. It actually really is a simple process that only takes a matter of a minute to edit. It amazes me how a couple simple edits can make the image look this way. If you are interested in learning how to make tilt-shift photography there are a number of good tutorials available on youtube. Just another little trick to play with via the wonderful world of photography. Nice! It really does look miniature, especially with no people around.